..... Click the link for more information. ), is continuous or intermittent, depending on the residual kidney function in the patient. Kidney transplants usually make hemodialysis unnecessary. hemodialyzer, an apparatus for the temporary replacement of the excretory function of the kidneys. The artificial kidney is used to rid the blood of metabolic products, to correct electrolyte-water and acid-alkaline balances in acute and chronic renal insufficiency, to remove dialyzing toxic substances in cases of poisoning, and to remove excess water in cases of edema. 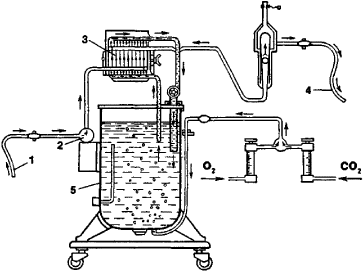 In 1913 the American scientist J. Abel created an apparatus for dialysis that was the basis for the design of the artificial kidney; in 1944 the Dutch scientist W.J. Kolff was the first to employ an artificial kidney successfully. The artificial kidney operates on the principle of the dialysis of substances through a semipermeable membrane (cellophane). Dialysis is a result of the differences in the concentrations of substances in the blood and in the dialyzing solution, which contains glucose and the principal electrolytes of the blood in nearly physiological concentrations without containing any of the substances that must be removed from the body (urea, creatinine, uric acid, sulfates, phosphates). Proteins, formed elements of the blood, bacteria, and substances with a molecular weight of more than 30,000 do not pass through the membrane. During hemodialysis (that is, the operation of the artificial kidney; see Figure 1) the patient’s blood is drawn off through a catheter by a pump from the inferior vena cava and passed inside the chambers of cellophane sheets of the dialyzer; these chambers are washed outside by the dialyzing solution, which is supplied by another pump. Partially purified, the blood is returned to one of the surface veins. Hemodialysis takes between four and 12 hours; during that time anticoagulants (heparin) are administered to keep the blood from clotting. In acute renal insufficiency the hemodialysis is repeated every three to six days until renal function is restored. With chronic insufficiency, when the treatment is necessary two or three times a week for several months or years, the artificial kidney is hooked up to a teflon shunt that is implanted between the radial artery and the surface vein of the forearm; in this case the blood can enter the dialyzer without the use of a pump. In the USSR, Sweden, France, and the United States, artificial kidney treatment is conducted in special centers that deal with kidney disturbances. The models used in the USSR are developed by the Scientific Research Institute of Experimental Surgical Equipment and Instruments of the Ministry of Public Health of the USSR. Semiautomatic systems for preparing the dialyzing solution and delivering it to the dialyzer are used in performing hemodialysis on several patients simultaneously. Iskusstvennaia pochka i ee klinicheskoe primenenie. Moscow, 1961. Fritz, K.W. Hamodialyse. Stuttgart, 1966. An apparatus that performs the work of the kidney in purifying blood; used only in cases of renal failure or shutdown. More than half of the demand for dialysis machines and artificial kidneys in the Chinese market is currently met through imports. They are DNA chips, artificial bones made of ceramics, intraocular lenses, implanted pacemakers and artificial kidneys (dialyzers). When planted into the animal whose DNA generated the clone, the artificial kidneys grew blood vessels and filter machinery and produced urine. The ultimate goal of Professor Little s research is to produce artificial kidneys for humans. The AEMD-45 therapeutic device, like all product offerings from Aethlon Medical, is developed from an expansive platform technology known as the Hemopurifier(TM), which employs a proprietary method to increase the capability of FDA cleared artificial kidneys (dialysis cartridges) to remove targeted intoxicants from the blood.